Andy Thibodeau interacts with students from Sandy Creek Middle School following his “Share Your Care” presentation in the district. Andy Thibodeau recently visited the Sandy Creek Central School District where he shared his Share Your Care message with students and parents in several assemblies. 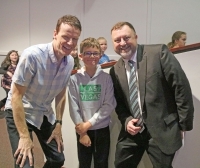 Thibodeau spoke to the elementary, middle and high school students during the day and stayed for a presentation for parents at the start of the Middle Schools Celebration of Learning. His message of caring talked about ways you can show you care in three points: 1) show up 2) participate and 3) listen and ask questions, or as he said, be borderline nosy. His message applies not just to doing well in school, but is also important in the students personal lives and their interactions with friends and family. Thibodeau praised the audiences for doing all three of his care points saying, you showed up, you've been participating, and you've been amazingly attentive listeners. Thibodeau is a motivational speaker who trains and inspires leadership in students across the US and Canada. 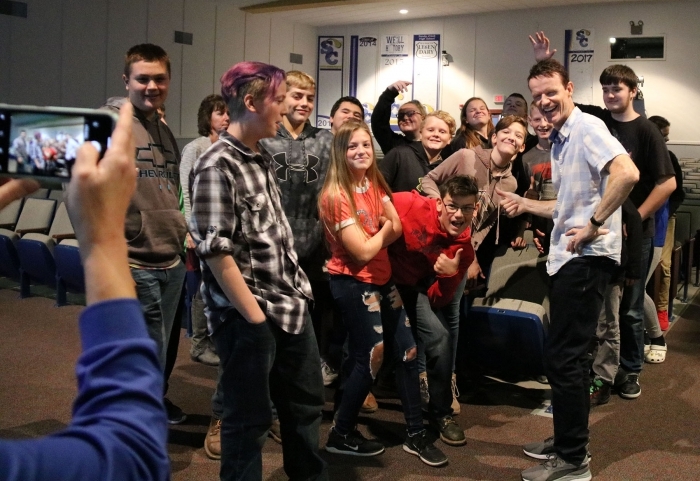 Teachers from Sandy Creek Middle School had the opportunity to hear Andy speak to a youth leadership conference and encourage the administration at their school to see if they could get him to come to Sandy Creek. He agreed to come to the district in time for the Middle Schools Celebration of Learning. Thibodeau lives in London, Ontario with his wife and two children. For more information on Andy Thibodeau visit his website at www.Andypresentations.com. 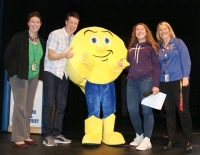 â��I can honestly say,â�� said Andy Thibodeau, â��that I have never been introduced by a Comet before!â�� Pictured left to right are: Sandy Creek High School Principal Emily Wemmer, Thibodeau, SC Comet mascot (Bailey Fahnestock), Alison Lantry and Middle School Principal Carolyn Shirley. “I can honestly say,” said Andy Thibodeau, “that I have never been introduced by a Comet before!” Pictured left to right are: Sandy Creek High School Principal Emily Wemmer, Thibodeau, SC Comet mascot (Bailey Fahnestock), Alison Lantry and Middle School Principal Carolyn Shirley. Andy Thibodeau posed with Brody Pecha, center, and Elementary Principal Tim Filiatrault, right following his presentation to the elementary students.